The West Philadelphia Promise Zone aims to reduce poverty and bring greater opportunity to people living and working in West Philadelphia. The initiative helps organizations work together to connect residents to high quality education, well-paying jobs, affordable housing, health services, and safe, economically healthy places to live. The Obama administration designated West Philadelphia as one of the first five Promise Zones in the country in January 2014. These ten-year designations were created to address challenges faced by people living in deep and persistent poverty and ensure that the zip code a person is born in does not determine their future. 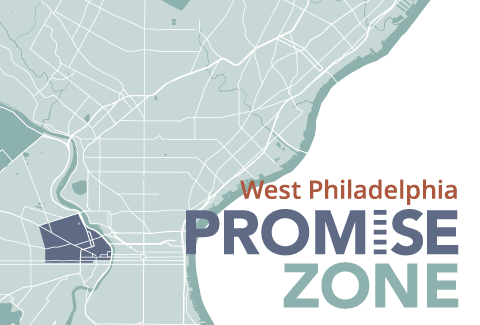 The West Philadelphia Promise Zone is now one of twenty-two Promise Zones that serve urban, rural, and tribal areas across the country. While these neighborhoods have significant needs, they also have tremendous assets, including well-organized civic groups, long-standing community service providers, public transportation, a commercial corridor, and proximity to large employers. Residents of many neighborhoods in this area helped develop two community planning efforts, Make Your Mark and We Are Mantua!. These plans highlighted community priorities that a Promise Zone could support. To be eligible for the Promise Zone designation, the area had to include at least one existing federal place-based initiative. A Byrne Criminal Justice Innovation initiative was in place in the Mantua neighborhood when the West Philadelphia Promise Zone was designated. Instead of providing new programs or services, the West Philadelphia Promise Zone helps existing organizations work together to increase opportunities for residents living, working, and going to school within its boundaries. The designation does not come with any direct funds, but rather provides “preference points” that make West Philadelphia more competitive than areas that are not Promise Zones across a variety of grant opportunities from federal agencies.